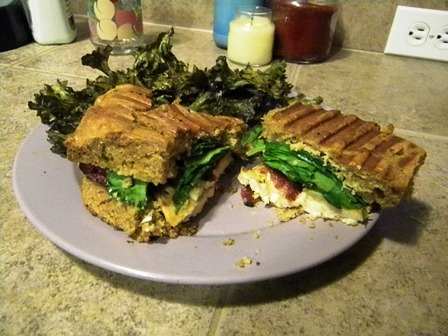 Yesterday I tried the recipe for SCD (and Paleo) Sandwich Bread I found at Against All Grain. I only made one slight modification: I used plain yogurt instead of almond milk. I haven’t tried making my own almond milk, and I haven’t found a store bought one that is SCD legal. The bread turned out really good. It has a nice flavor, and the texture is actually kind of bread like. It’s one of most satisfying grain-free breads I have made. As you can see from the picture it looks like bread! One of the things I haven’t liked about the other breads I’ve made is I don’t care for the almond flour taste. I don’t mind it in sweeter things, like cake and cookies, because there are usually some other flavors in there. This recipe uses cashew butter. The flavor is much more subtle. 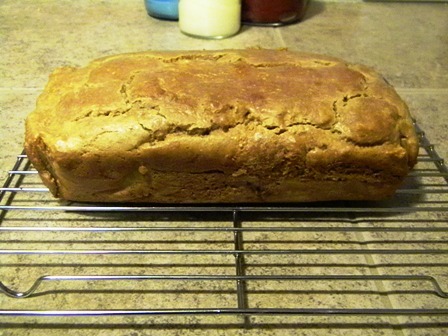 The bread was also softer and less oily than the bread I have made with almond flour. I attempted to make a panini with the bread, and I didn’t quite do it right. The bread ended up falling apart when I tried to eat the sandwich. It wasn’t a total loss, I was still able to eat most of it, and there wasn’t anything wrong with the taste. To make the panini, I didn’t slice it in thin slices. Instead I cut a big piece and sliced that lengthwise. I thought this would make it thick enough to hold my chicken sandwich. The chicken breast, along with lettuce, tomato, cheese, and turkey bacon may have been a little too much to keep things together. I also should have toasted the bread on the inside before putting the sandwich toppings and putting it on the panni press. I left the bread a little too soft on the inside, but not toasting it first. Though my sandwich didn’t quite turn out the way I wanted, the bread is still very good. I plan to try it out for some toast, and a smaller sandwich! Here’s my sandwich. It still tasted good. How did you get your bread to rise? I did everything exactly, even added the pan of water on the bottom rack. I’m a proficient bread baker, and somehow cannot seem to get this bread to rise. Mine doesn’t rise that much either. I think it’s a matter of really whipping the egg whites for several minutes. I’ve never gotten mine to look as good as the Against all Grain pics.